Assemblies - American Hydrotech, Inc.
Monolithic Membrane 6125 (MM6125®) is a thick, tough, flexible, self-healing membrane for use in waterproofing. MM6125 is a special formulation of refined asphalts and synthetic rubbers. MM6125 has been successfully used worldwide by leading architects, engineers and owners on all types of horizontal and vertical structures including plazas, parking decks, planters, tunnels, bridges, mud slabs, foundation walls and roof areas...establishing an unbeatable track record of almost 50 years. Monolithic Membrane 6125 (MM6125®) is a thick, tough, flexible, self-healing membrane for use in roofing applications. MM6125 is a special formulation of refined asphalts and synthetic rubbers. 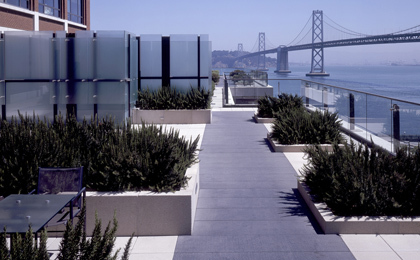 MM6125 has been successfully used worldwide by leading architects, engineers and owners on all types of horizontal and vertical structures including plazas, parking decks, planters, tunnels, bridges, mud slabs, foundation walls and roof areas...establishing an unbeatable track record of almost 50 years. 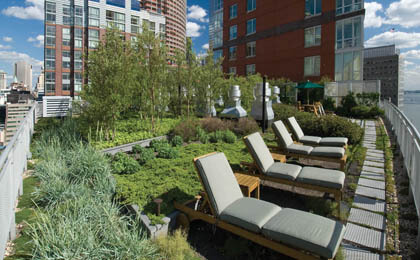 Ideal for roof terraces, green roofs and plazas, The Ultimate Assembly begins at the substrate with Hydrotech's premier waterproofing membrane, Monolithic Membrane 6125®, and carries through to the overburden of the architectural pavers. The assembly can accommodate insulation, extra drainage layers and a variety of job site conditions. 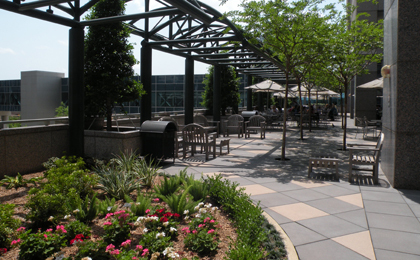 And due to a special production process, Hydrotech's architectural pavers offer high compressive strength, low moisture absorption, and a wide variety of colors and textures. 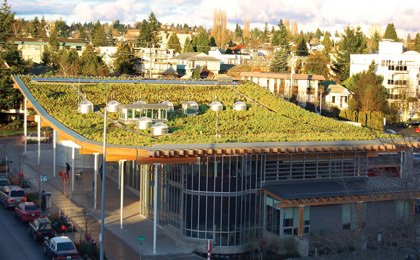 Replacing the impervious surface of a conventional roof with a "green roof" can help to substantially reduce storm water run-off and restore the balance with nature in our urban centers.